UK born Lady Margaret Turnbull, the owner of Lawler’s Loft bed and breakfast, in Bangalow New South Wales, Australia, is asked by the wife of the local Barclays UK stockbroker, Winston Broad to investigate his disappearance. She is reluctant……. until he turns up dead. Detective Tom Sullivan investigates and initially concludes that Mr. Broad has run afoul of a greedy property developer. 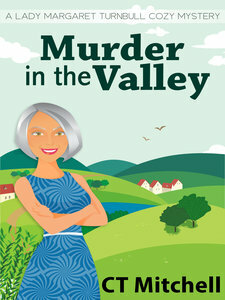 But village busy body and part time woman sleuth Maggie Turnbull has other ideas, which to the annoyance of Detective Sullivan are usually right. “Greed and money are common bed fellows” is Maggie Turnbull’s credo for which she must untangle a web of lies, deceit and secrets that will require her to dive deep into local government records to catch today’s perpetrator in this international cozy mysteries series. Mystery novel Australian crime fiction author C T Mitchell masterfully creates a series of twists and turns in this amateur sleuth murder mystery that will keep you guessing right to the end. Come sample this short story novella from a sleepy village Down Under.